“It is absolutely clear that we are slow-walking the port of entry the efforts for individuals to seek asylum,” Merkley said at a Capitol Hill news conference Tuesday. Merkley and Van Hollen said undocumented immigrants are being turned away from legal ports of entry, preventing them from seeking asylum and leading them to illegally cross the border in other areas. Merkley noted that this is a change from his previous visit to the Southwestern border in early June. “The bridge has now been swept clean,” Merkley said, referring to the McAllen-Hidalgo international bridge where migrants may cross into the United States. Trump administration officials have said that adults will not be prosecuted for illegal entry if they claim asylum at a port of entry. "[Immigrants] can go to our ports of entry, if they want to claim asylum. And they won’t be arrested," Attorney General Jeff Sessions said Monday. 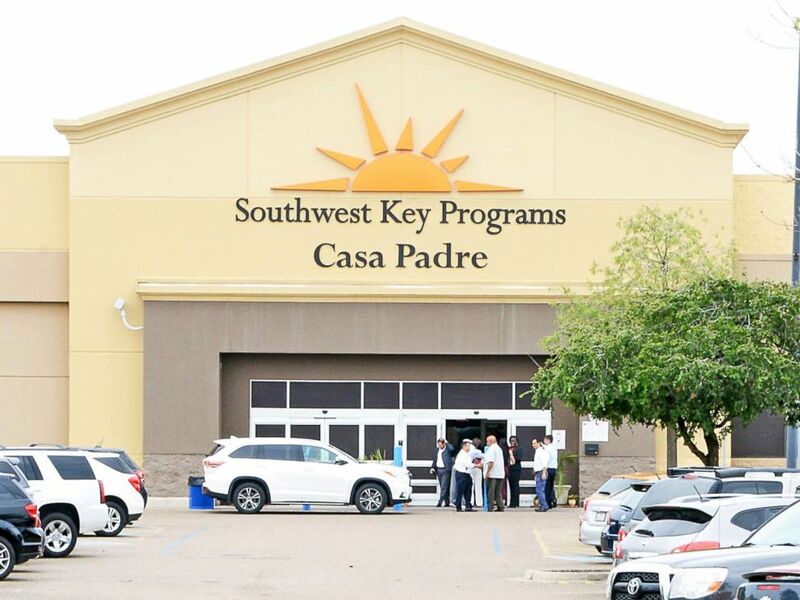 Dignitaries take a tour of Southwest Key Programs Casa Padre, a U.S. immigration facility in Brownsville, Texas, on June 18, 2018, where children are detained. But Merkley and Van Hollen said that guards are turning immigrants seeking asylum away from legal border crossings. “Secretary Nielsen talking about welcoming people who come across legal ports of entry to make their asylum claims is just total fiction if you actually look at what’s happening,” Van Hollen said of the Homeland Security secretary's comments. “Our border guards are now out stopping anyone who does not have papers from progressing to the American side,” Merkley said. A Department of Homeland Security spokesperson directed ABC News to a Monday press release about Customs and Border Protection procedures. "CBP processes all aliens arriving at all ports of entry without documents as expeditiously as possible without negatively affecting the agency's primary mission to protect the American public from dangerous people and materials...as the number of arriving aliens determined to be inadmissible at ports of entry continues to rise, CBP must prioritize its limited resources to ensure its primary mission is being executed," the statement said. The senators described meeting a “young woman from Honduras” with a sixty-five day-old baby at the processing center. The woman’s family had reportedly taken a loan out from a private bank in Honduras and could not repay it. According to the senators, the bank’s ties to the neighborhood drug cartel threatened the woman’s family, leading her to flee to the U.S. shortly before her uncle was killed. “She walked among the cars instead of the pedestrian walkway and pretended to be washing the windows of the cars in order to get to the American side, where she could then knock on the doors and be admitted,” Merkley said. “One of them had crossed a legal port of entry and she still found herself separated from her daughter,” Van Hollen said. Merkley visited an immigrant children’s detention center in Brownsville earlier this month, where he described language barriers between staff and children and a shortage of mental health providers. But Nielsen said that despite limited resources, “children in DHS and HHS custody are being well taken care of,” and that adult immigrants would be told to “come back” if there were a shortage of caretakers at processing centers. On Father’s Day, Merkley returned to South Texas, this time bringing a delegation of Democratic lawmakers with him, including Van Hollen and three representatives from Texas. “[The trip] did confirm my worst fears,” Van Hollen said.